We’ve discussed at length why we’re toner’s biggest advocate, and now that we have two new toners in our line—both of which are powered by Witch Hazel—it’s time to update our primer. But first things first: why Witch Hazel? Witch Hazel (or Hamamelis virginiana, as it appears on the ingredients list of a product label) has long been used to treat a variety of ailments, and in skin care specifically, it’s beloved for its ability to cleanse, clarify, and help soothe the complexion. Natural astringent and antiseptic properties make it a favorite for normal to oily skin types; Witch Hazel removes excess oil and surface impurities without leaving skin feeling dry or tight. Used alone, it re-balances—and when combined with other skin-loving ingredients, Witch Hazel toners are able to infuse weightless botanical benefits into your skin. For years, Seaweed Cleansing Lotion was the first and only Witch Hazel-based toner in our line. Formulated to provide enhanced cleansing while replenishing skin, this fresh, marine botanical-infused astringent has been a universal favorite for all skin types. #MBSkinTip: This is the toner our aestheticians recommend for pre-teens or teens who are experiencing their first bout of breakouts but aren’t quite ready for an aggressive, troubled-skin astringent like Special Cucumber Lotion. In fact, Seaweed Cleansing Lotion is the perfect introductory toner for most skin types: it’s clarifying without being harsh on young, temperamental skin. This floral toner was formulated with all skin types in mind—and the Rose-obsessed, too. It’s cleansing, clarifying, and rejuvenating thanks to the trifecta of Rose ingredients, which makes it perfect for the person who wants a radiance-boosting refresher without the use of an exfoliating fruit enzyme or alpha hydroxy acid. Meet our latest toner, a Lavender-infused astringent created to help soothe and refresh stressed skin. Any remaining oil, makeup, or surface impurities are removed without stripping skin of its natural moisture—all while restoring calm and clarity to skin. #MBSkinTip: For ultra-sensitive or reactive skin, try Chamomile Cleansing Lotion instead. It’s the mildest toner in our line, formulated fragrance-free. SEE OUR FULL COLLECTION OF TONERS. And then there’s the inevitable waiting period: that ticking clock between take-off and rushing to the nearest bathroom at arrival to check the state of your skin. If there’s one thing worse than inconsiderate neighbors encroaching on personal space, it’s the havoc that cabin air seems to always wreak on every complexion. So—why does skin freak out when you fly? All skin types—even oily ones—are vulnerable to experiencing discomfort. Recycled cabin air, refreshed only by air taken from the surrounding low-humidity, high altitudes atmosphere, is incredibly drying on skin. Without the moisture needed to help skin feel comfortable, air on board just seems suffocating. Combat dryness, flakiness, and tightness by keeping skin hydrated and well-moisturized. 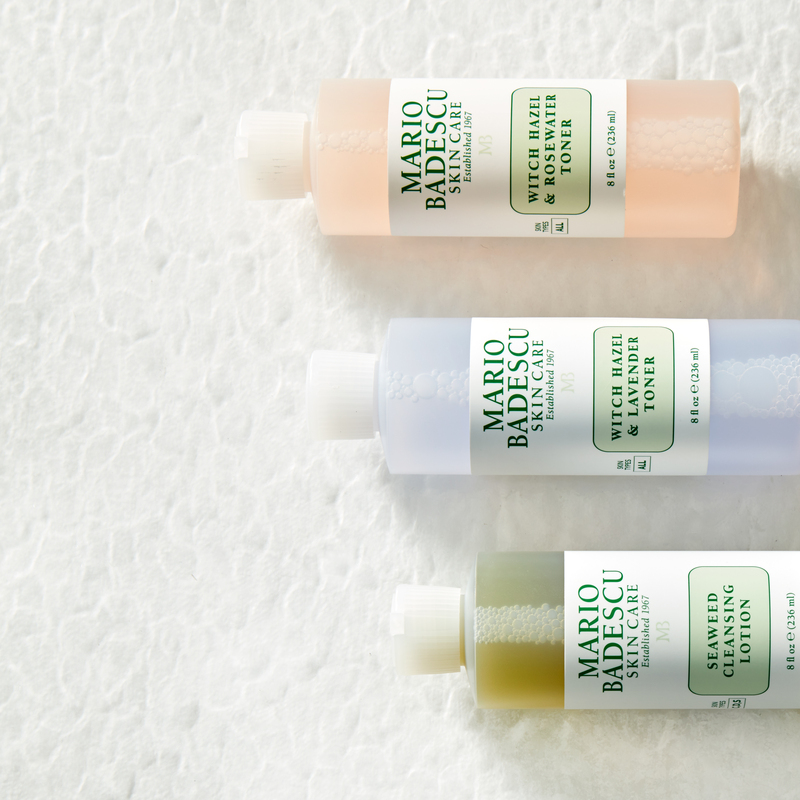 A few spritzes of your favorite facial spray will help instantly hydrate and refresh skin. Use as needed throughout your flight and just before landing for an impossibly dewy complexion. Nourish dry and dehydrated complexions with a few drops of Rose Hips Nourishing Oil, a lightweight facial oil that helps boost radiance with Rosehip Oil and Rosehip Extract. Apply a few drops to target any areas prone to dryness, or massage all over your skin before taking off. Layer your favorite moisturizer on top, and don’t be afraid to re-apply your oil as needed. Replenish skin and help guard against moisture loss with Hydro-Emollient Cream. Also famously known as the go-to “in-flight” cream for dry skin types or frequent flyers, this rich face helps lock in hydration and give skin a softer, smoother, and more supple appearance. Skin doesn’t just experience dryness, unfortunately. Imbalance: When skin is thrown into extreme conditions and suddenly experiences intense dehydration, oil glands are kicked into high gear in an attempt to compensate for lack of moisture. Dead skin cell buildup and excess oil clog pores, making way for—you guessed it—breakouts. Stress: When the body experiences stress, a hormone called cortisol is released. Studies have shown that there’s a direct correlation between increased cortisol levels and acne breakouts. Plus, stress-related habits (poor eating habits, lack of sleep, etc.) only add to the problem, causing sebum glands to secrete an oily, pore-clogging substance. Travel stress and long flights are simply no good. Bobbi pins, clips, or hair ties: Keeping hair off your face can help prevent breakouts. Lip Balm: Apply a thick a layer and let the blend of nutrient-dense butters and skin-conditioning oils nourish your lips. Leave it on for the duration of your flight (as if it were a lip treatment mask), then blot the excess off before you land. Drying Cream: Feel a bump coming up? Dab a tiny amount onto the spot and blend well. Drying Cream is effective in helping dry up those small, under-the-skin blemishes and prevent them from getting any larger. Drying Lotion: … and clean Q-tips. Your favorite on-the-spot solution comes in a travel-friendly plastic bottle so you can fly with peace of mind. True, rocking pink polka dots in public may not be everyone’s cup of tea, but we’re all for dabbing this Salicylic Acid and Calamine solution if you need to—especially for red-eyes or long-haul flights. Every month, we revisit our medicine cabinet and re-work our top shelf based on what our skin needs. We take into consideration the current state of our complexion—dry from a harsh winter? Oily from a long summer?—seasonal changes, and what concerns we want to hone in on and target. March was a little rough. 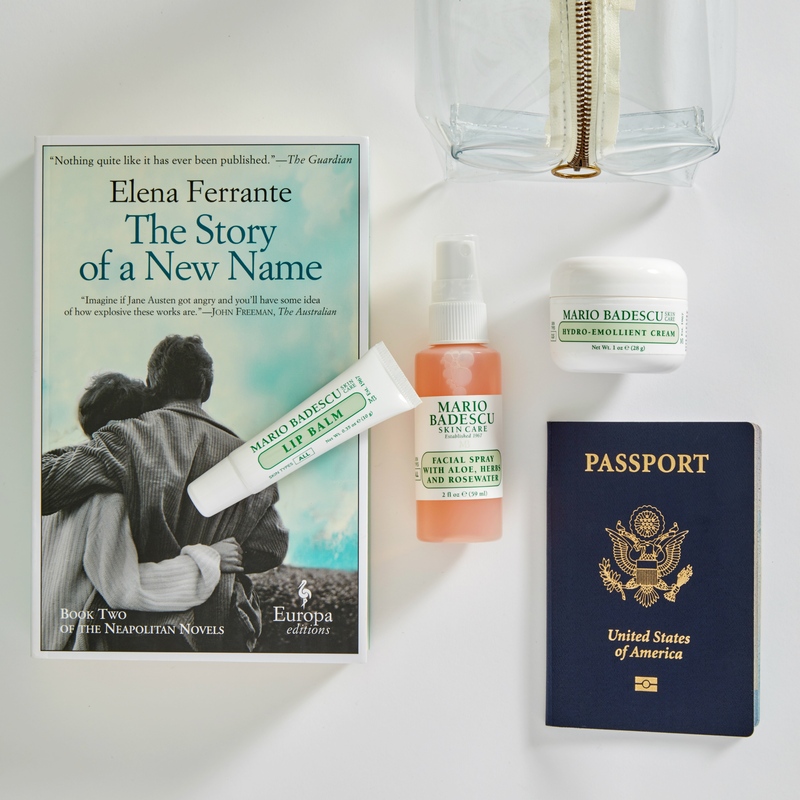 Unpredictable weather (we volleyed between 70-degree weather and snow within one week here in New York City) left our skin confused and out-of-sorts, so the priority for April is to re-balance and reset. Our go-to face wash when we want something that’s fresh, easy, and leaves our skin feeling exceptionally clean—never dry or tight. Papaya and Grapefruit Extracts add the perfect zing that gets us in the mood for warmer weather, sun, and other fun things. Florals for spring? A predictable (though never poor) choice when it comes to the sartorial, but always perfectly suited for skin this time of year. Witch Hazel provides a clarifying boost that helps keep excess oil in check, and a blend of Black Rose Extract, Rose Oil, and Rosewater leaves skin looking healthy, youthful, and rejuvenated. True, we have four face mists at our disposal, but we have a soft spot for the original cult favorite. Nearly four decades after its inception, this Rose-infused facial spray still has reigning position in our medicine cabinets and our hearts. Mist before moisturizer for added hydration, throughout the day as an instant pick-me-up, or after makeup for a dewy, fresh-faced finish. The possibilities are endless. Even if you disregard the host of skin-loving ingredients packed into the tiny pot, you’ll find that judging on texture alone still makes this eye cream so easy to love (and reach for). Ceramide Herbal Eye Cream is between a lightweight cream and a balm: there’s a little bit of bounce when you dip your ring finger in the pot, but the moment you press the product to your skin, it glides on with ease. A blend of nourishing oils, Hyaluronic Acid, and antioxidant Vitamin E melts into skin to replenish skin as Eyebright Extract restores radiance to tired under-eyes. Prefer an oil-free formula? Try Ceramide Eye Gel. Love a traditional cream texture? Use Hyaluronic Eye Cream. Not sure which eye cream is right for you? Check out our guide. Sometimes the changing of the seasons can leave skin a little out-of-sorts (with a new few spots to boot, literally), and this face cream is the perfect pick for fickle, oily, or troubled skin. Classic, creamy, and oil-free, this Aloe-infused formula is the perfect daily moisturizer that hydrates and re-balances the complexion. For when you need a deep clean but also a moisturizing, floral-infused boost. A few times a week, apply this Gardenia-infused clay mask to draw out pore-clogging impurities and refine your complexion. Navigating the beauty world at large can be a dizzying experience, especially when you’re on a mission to find a solution, fast. Somewhere between a late-night YouTube/Instagram hole (which may or may not have been punctuated by a dimly-lit phone falling on our face, mid-scroll) and giving up altogether, there’s clarity. 1. Get to know your skin. We recommend taking our free skin analysis as a jumping off point to receive a customized regimen, but it’s also important to consult an aesthetician. If you’re experiencing chronic acne, redness, sensitivity, or any other pressing concerns, do see a dermatologist. You’ll cut out a lot of trial and error when you work with an expert. It’s human nature to go into a frenzied spree because you think you need everything, but resist as best you can. More often than not, the root of any concern (like a breakout) is an imbalance that results from something as simple as improper cleansing or lack of hydration. Hit pause before you buy every serum or spot treatment under the sun. The last thing you want to do is overwhelm both you and your skin. Cleanser: Face wash seems like such a simple, inconsequential thing, but it easily may well be the most important product in your entire routine. Without a clean slate, anything applied onto the skin is useless. Make sure you wash away the makeup, oil, and impurities so your skin can actually absorb the benefits of your beloved serums and creams. Toner: Also to be used twice daily. Toner helps re-balance the skin and impart complexion-boosting benefits, too. Eye Cream: The eye area is one of the most delicate parts of your skin, so treat it with extra love and care. 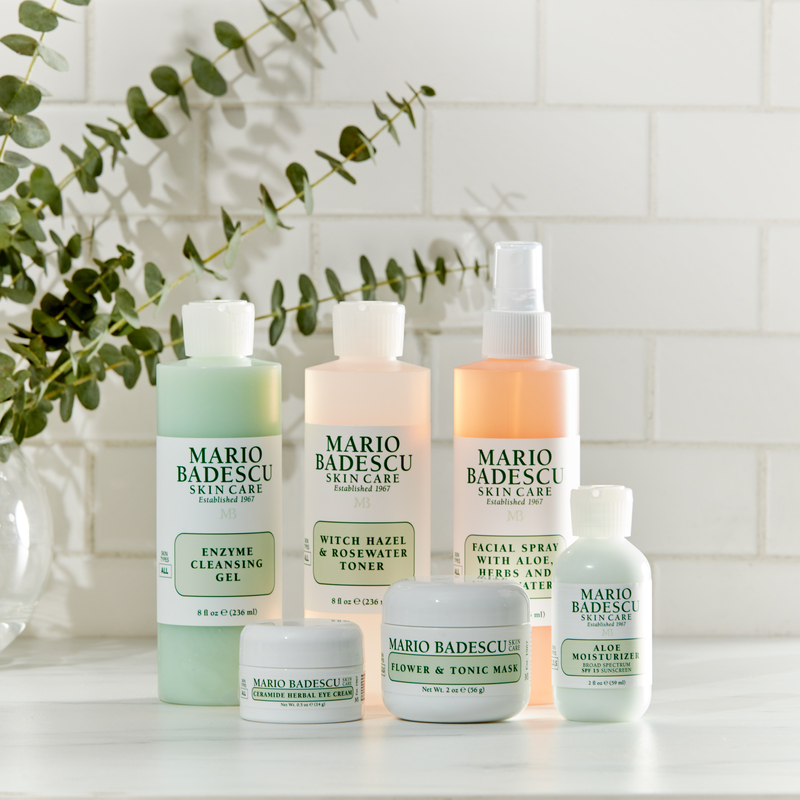 Mario Badescu was a firm believer that everyone over the age of 21 should have an eye cream in their routine. Apply eye cream every morning and evening to ensure your skin stays well moisturized. Moisturizer: Hydration is key, no matter your skin type. Finding the right level of moisture is the difference between a happy, balanced complexion and one that’s, well, not. When properly moisturized, oily skin types will find that they’re far less prone to a greasy T-zone—and parched skin will relish in a dewy, healthy glow. Exfoliant: Regular exfoliation is the solution to most skin care woes. Dull? Flaky? Congested? Uneven in tone and texture? Exfoliate. Our aestheticians recommend exfoliating 1-2 times a week for dry to normal skin, and 2-3 times a week for combination to oily skin types. Mask: Masks are still having a moment—but they’ve been a core part of the MB regimen since 1967. Your twice-daily routine is maintenance; masking 2-3 times a week allows your skin to hit the reset button. 3. Introduce new products one by one. Now that you have your regimen outlined, it’s tempting to try everything all at once… but don’t. Reign in the excitement just a bit and take it step by step, product by product. Doing so will allow you to actually gauge if a new product is effective, or in the case of a reaction (like a breakout), you can pinpoint the problem instantly. Start with one to two products a day, then continue to add on. If you have sensitive skin, patch-test each product before using it on your face. Apply a pea-sized amount to your inner elbow or wrist; if you experience irritation or redness, try something else instead. Once a product gets the green light, try it out for a week before adding another new product into the mix. 4. Ready to take it to the next level? Once you’ve established the foundation, you’ll have a more accurate read of what your skin likes and truly needs. You might not need anything beyond your MB “six,” but if you find that you do, start adding additional products like a night cream, serum, spot treatment, or secondary mask (to rotate or multi-mask with). You’ve seen our facial spray everywhere, but how do you actually use a face mist? Good news is that there’s no wrong way to use it, but there are a few ways to use it with purpose. We recommend misting your complexion after you’ve cleansed and toned your skin, but before you apply your moisturizer. Doing so will not only give your skin a botanical boost, but it’ll add essential hydration to your skin—which you then seal in with your face cream. Read this for more ways you can use your facial spray. Serums go on before your moisturizer or night cream. The only exception to the rule are products like our Herbal Hydrating Serum and Rose Hips Nourishing Oil, which can be applied before or after. Targeting breakouts? Apply Drying Lotion or Drying Cream directly onto the blemish and leave it alone. Avoid applying serum or face cream on top, and instead, moisturize around the area. Learn more about the art of layering skin care, here. 5. Don’t be afraid to change your routine. You should follow your regimen religiously, but that doesn’t mean the products within your routine are set in stone. Allow for flexibility because your skin is living, ever-changing organ; anything from seasonal shifts to new stress can affect it. For example: You may find that your skin tends to get a little flaky and dehydrated come fall. Try incorporating an acid into your daily routine—such as through Glycolic Acid Toner—to help remove the buildup of dulling, dead skin cells. Then, counter the moisture loss by layering a serum under your current moisturizer or choosing a richer face cream. Say you’re off to a warm-weather beach vacation. Lucky you! Arrive prepared, because the combination of travel stress and shock from extreme climate change can wreak havoc on our skin. Herbal Hydrating Serum will prove to be your best friend; it’s lightweight, oil-free, and can be worn over moisturizer to boost hydration or alone on super-hot, humid days. If your skin is oily to begin with, swap out Enzyme Cleansing Gel for Acne Facial Cleanser, which contains Salicylic Acid to help break down pore-clogging impurities and keep skin looking clear. Dry? Use Enzyme Cleansing Gel or Seaweed Cleansing Soap instead of your at-home face wash to rejuvenate skin. Don’t be afraid to change up your toner, too. Go a step up to combat unwanted shine and sweat. For example, dry skin types might want to use Seaweed Cleansing Lotion instead of their usual Aloe Vera Toner since the Witch Hazel boasts astringent properties. Combination skin should try using Cucumber Cleansing Lotion instead of Seaweed Cleansing Lotion, and oily types might find that Special Cucumber Lotion is a savior in clarifying and refreshing skin. For more ideas, check out our #MarioMonthlyEdit where we show you how we’re switching things up our top shelf. Spring is in the air—which means it’s time to spring clean our medicine cabinets. Skin can be a little finicky as it adjusts to the changing seasons. Our solution? Picking products with the same precision Goldilocks did (without drumming up a fight with three bears, luckily) so everything is just right. Creamy, mineral-rich, and formulated with real (yes, real) seaweed grains, this easy-rinsing face wash leaves skin feeling rejuvenated. It’s a double-duty face wash that exfoliates while cleansing your skin, which means you get a little glow-boosting action twice daily. Plus it smells like the sea—every bit fresh and beach-y like its ingredients. Some skin types tend to get oilier once the weather warms up—but they’re still a little dehydrated or too winter-worn to start using the Cucumber Cleansing Lotion just yet. Enter the Seaweed Cleansing Lotion, a mild astringent that’s formulated with Witch Hazel to help cleanse skin of excess oil and impurities without overdrying skin. Bladderwrack (a mineral-rich seaweed) and Aloe Vera combine to soften and lightly hydrate—leaving skin refreshed and re-balanced. Exfoliate away the dull, winter blues. Literally. Swap out your rich, winter eye cream for something a little more lightweight. Hyaluronic Acid and Safflower Seed Oil are the power players in this formulation that replenish and lock in moisture without feeling heavy on your skin. Though simple by nature—the name says it all—our Honey-infused moisturizer is truly a gorgeous formulation that softens, smooths, and boosts radiance in combination skin. For extra nourishment in the evenings, reach for this oil-free night cream. A luxe, silky-smooth texture makes it a treat to apply every night. And come morning, you’ll wake up with softer, smoother, dewier-looking skin.